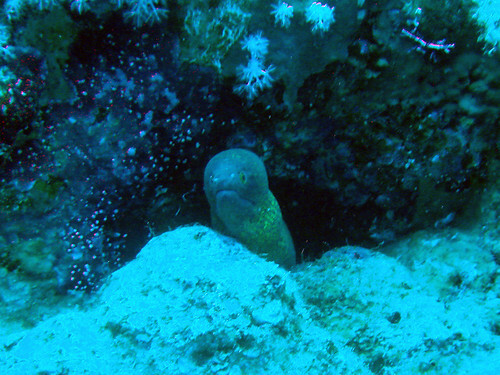 Baby Giant Moray Eel, Shark Reef, Ras Mohammad, Egypt, originally uploaded by Craig Grobler. The giant moray is widespread in the Indo-Pacific region, being found in the Red Sea and East Africa, the Pitcairn group, north to the Ryukyu and Hawaiian islands, south to New Caledonia and the Austral Islands. As the name suggests, this is a large eel, reaching up to 300cm (9.8 ft) in length and 30kg (66.1 lbs) in weight. While juveniles are tan in colour with large black spots, adults have black specks that grade into leopard-like spots behind the head and a black area surrounding the gill opening.